Despite dramas for both teams in the first 45 minutes, the anticipated battle between Peugeot and Audi never really happened as the Pug turbo-diesels dominated. Have you heard the one about the Spaniard, the Austrian and the Australian...? Well, here's the latest one: Aussie David Brabham has won the 77th running for the 24 Hours of Le Mans at his 16th attempt, the popular sportscar veteran teaming with Marc Gene and Alexander Wurz in one of three factory Peugeot 908 HDi FAP turbo diesels contesting the enduro this year. 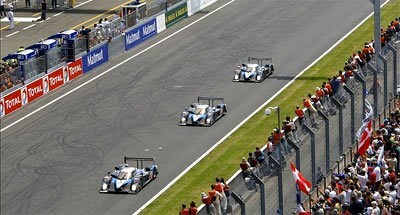 Brabham, 42, is the fourth Australian after Bernard Rubin, Vern Schuppan and his own brother Geoff to win at Le Mans. The three Peugeot works cars showed they were entitled to favouritism over the Audi squad that had dominated the classic in recent times. It was the factory's third attempt with its 908 diesel (and Brabham's 16th...). It managed to take pole each time, but couldn't put its race act together until yesterday. Peugeot ended Audi's run of successive victories in scoring its first victory at Le Mans since Geoff Brabham was part of the winning driving team in 1993. The Peugeot # 9 was one of the few cars to have a trouble-free run in the world's most famous sportscar race. Note Bordais fourth from the left, in tears. The trio of Gene/Brabham/ Wurz completed 382 laps in 24 hours, one lap more than the pole-winning # 8 Peugeot driven by the all-French squad of Sebastien Bourdais, Franck Montagny and Stephane Sarrazin. Audi kept the pressure on until a few hours from the end when its #1 car slipped back with an engine problem. Defending champions Allan McNish, Rinaldo Capello and Tom Kristensen of Denmark finished third, six laps behind the winning Pug. The 908 of Sarrazin/ Montagny/ Bourdais led from the start, until it pitted with a disc bell problem, which dropped it down the order. The third factory 908 of Minassian/Lamy/Klien was involved in a bizarre early pit lane shunt with the similar private Pescarolo entry which caused damage and cost both cars any chance of victory. The Gene/Brabham/Wurz machine ran consistently and was in front by around quarter distance. Only ever seriously under threat by the recovering Sarrazin/Montagny/Bourdais Peugeot, the drivers of the #9 908 went into cruise mode in the concluding stages. The pair crossed the line in a formation one-two finish, with the third surviving factory car also in the frame but many laps down.